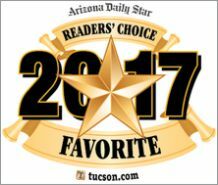 Thank you Tucson for voting us six years in a row! We could not be more proud and are grateful for your confidence and support!! Once again Tucson, thank you for voting us Best Eyeglass & Optical Retailer… 5 years in a row! 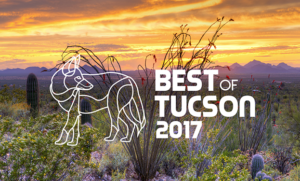 Once again Tucson…Thank you for voting us Best Vision Service providers for three years!! All of us here at Alvernon Optical could not be any prouder! 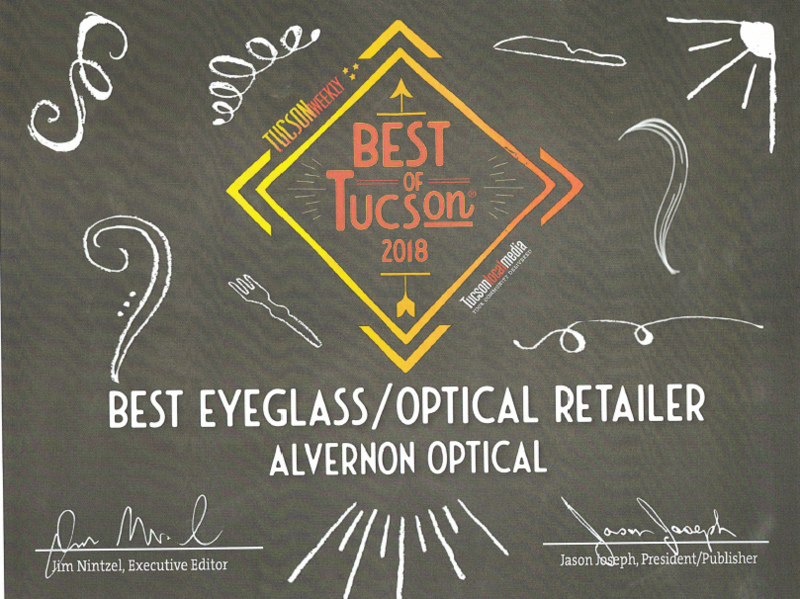 Thank you Tucson for voting us Best Eyeglass & Optical Retailer 4 years in a row!!! Thank you Tucson for voting us Best Vision Service providers for two years!! 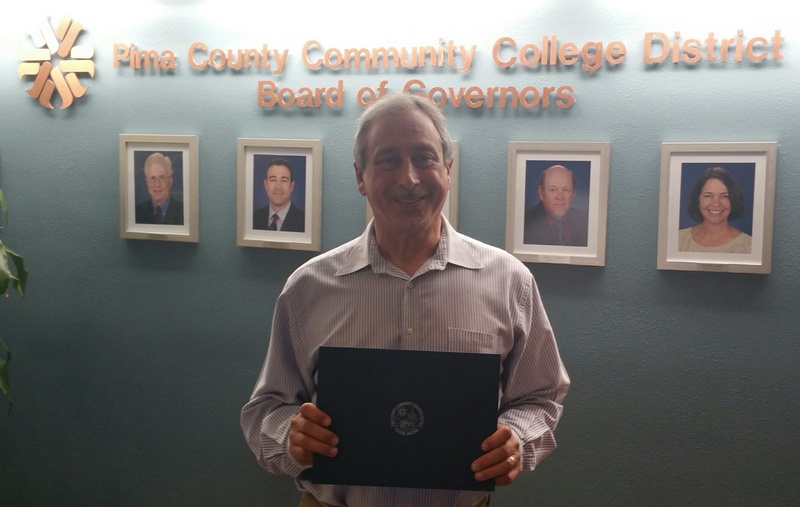 The Adult Basic Education for College and Career (ABECC) program was developed 25 years ago through Pima Community College. 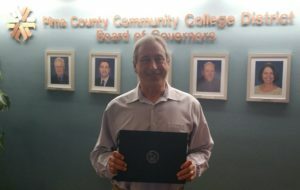 Over the past 25 years Dr. Paul Cinalli has donated through this program around 40 – 50 eye exams yearly, totaling over 1,200 exams to date, in an effort to help these students see their school work. The program specifically helps adult students in reading, writing and math skills as well as high school equivalency testing. The students develop job skills so that they can be self supporting. This is only one of the many ways in which Dr. Cinalli gives back to the Tucson community. He is a 22 year member of the Rotary Club of Tucson which donates on average of $100,000 a year to Tucson charities. 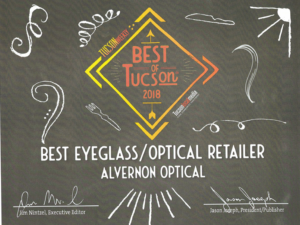 Everyone at Alvernon Optical is very proud to have been voted for providing the Best Vision Service in Tucson by the readers of the Arizona Daily Star. The folks at Alvernon Optical have been providing superior service in Tucson since 1961.That is fifty four years! They have done this by having licensed opticians, certified lab techs, exceptional support staff, and local owners. It takes a real commitment to maintain a full service optical lab. If you should break your glasses most frame repairs can be done on site while you wait. Another convenience is that within each Alvernon Optical office there are independent doctors of optometry offering eye exams and providing the best primary eye care. The next time you need help with your eyeglasses visit any of the six convenient locations so that you can experience the friendly service offered by the knowledgeable professionals at Alvernon Optical. Oww! You know how it feels when you get a spec of sand in your eye. Imagine a baseball or tennis racket smashing your sunglasses into hundreds of pieces of plastic shrapnel. You want your child to do well in sports and you want them to be safe. So you get them the best equipment available including sports glasses. But did you know that sports glasses are rated for various sports? What is acceptable for basketball may not give adequate protection when on the baseball field. Injuries do happen, quite frequently. Many eye injuries occur on the basketball court and baseball field. All sports have potential for eye injury. Golf clubs, tennis rackets, or rocks and tree branches while cycling, every sport has its dangers. You might not guess which sport has the fastest moving object, motorized racing aside. It is badminton with shuttlecock speeds of 200+ MPH. If prescription lenses are going to be put into the frame special considerations must be followed. Sports glass frames are not made the same as dress glasses. The bezel (groove) is deeper with a lip on the back side so that if strong impact occurs the lens will not be forced out the back of the frame. Lens thickness is also important. Dress glasses can use 1.0 mm thick polycarbonate lenses. With sports glasses the minimum thickness should be 2.0 thick polycarbonate. There are two manufacturing and performance standards used in the U.S. which are the American National Standards Institute (ANSI) and the American Society for Testing and Materials (ASTM). ASTM F803 is typically used for sports eyewear and covers most ball/stick sports. There can be exceptions. An example is girl’s lacrosse which has set specific standards for that sport. When you are shopping for sports glasses make sure that you advise your eye care professional (ECP) of all sports you or your child may be engaged in so that a frame can be selected that is rated for all the anticipated sports. One thing to consider, many people wear contact lenses while playing sports thinking they have an edge not wearing glasses. According to a 2010 report from Prevent Blindness America there are an estimated 2.4 million eye injuries in the U.S. annually. Sports account for over 25,000 injuries per year (2014). Younger athletes are still developing and may not have the hand/eye coordination nor the agility of an older player resulting in higher incidences of injuries of all types including the eyes. Some of these eye injuries result in permanent loss of vision in the injured eye. Even if contact lenses are used to correct vision protective eyeglasses are still recommended to prevent injury. Alvernon Optical carries Progear Eyegaurd sport glasses which have been rated for baseball and all other sports covered by ASTM F803-03. The friendly and knowledgeable ECPs can help you make the right choice for safety and performance. Alvernon Optical has a full range of sports eye glasses. In addition to Progear Eyegaurd we carry WileyX (which are ANSI safety frames), Rudy Project (a favorite with runners and cyclists), and Liberty Shark swim goggles (water and pool activities account for more eye injuries than any other sport). Need and eye exam? There are independent doctors of optometry at each Alvernon Optical office who can help you have the sharpest vision possible with a thorough eye exam. Most insurances are accepted. Visit any of the six convenient Alvernon Optical locations today and get the eye protection you deserve to keep you in the game for years to come. Green is good. Right? Often we think of green products as being made from recycled materials or materials that can be recycled when the product is no longer needed. German designer Thomas Trauth has collaborated with Free Form Eyewear to develop the Green Collection. The Green Collection incorporates a simple design to minimize the production steps necessary to produce these frames. The production processes requires 66% less time which equals less energy used. The frames use half the amount of material than what is used to make a traditional eyeglass frame. No toxic materials are released during production. 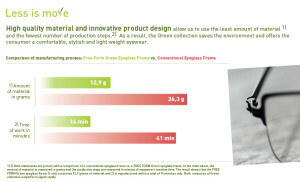 All this adds up to a truly Green eyeglass frame that you can feel good about wearing. Did I mention they are really, really light? To give you the clearest vision possible we recommend lenses with an anti-reflective coating (AR) to reduce the glare that can occur in the lens. 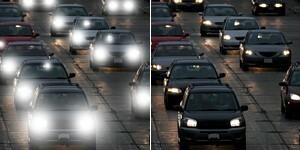 AR reduces eye strain and enhances vision, especially when at a computer or driving at night. Premium coatings like Crizal or Super Hi Vision EX3 also give you increased scratch resistance and have hydro/oleo-phobic properties to make them resist smudges and moisture which translates to cleaner lenses. Stop in one of the six convenient Alvernon Optical locations and see for yourself how innovation, simplicity, style, and function can equal one great eyeglass for you! From time to time someone will ask, “I saw a frame I liked in Europe. Can I order it from you?” Sometimes we can and sometimes we can’t. There are a couple of reasons. One, the company may not distribute their frames in the United States. But the big frame companies do sell their frames worldwide, so why can’t I get that frame here in the U.S.? The reason is the companies target market the product lines and that means they will sell specific models or colors only in certain regions. You may very well see a frame in France that is sold in the U.S., only not in that particular color. Exciting news! 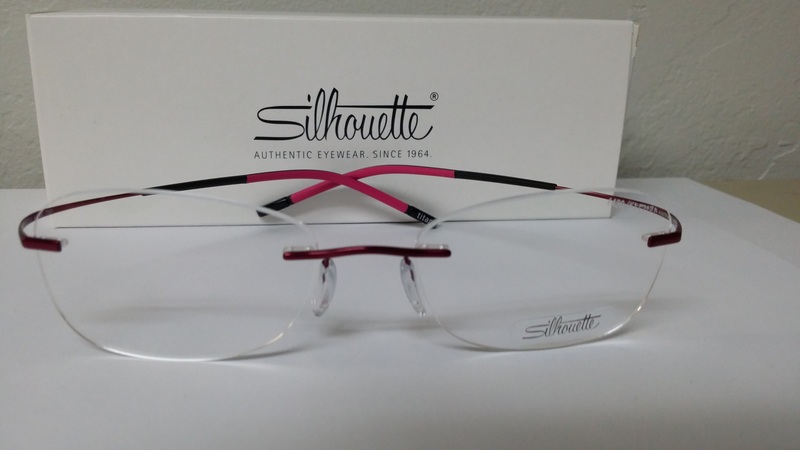 Alvernon Optical has partnered with Silhouette Frame Company to test market four colors of the Titan frame that have been very popular in Europe. 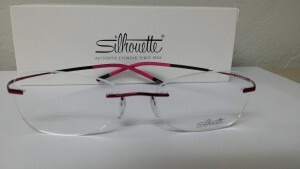 Because of the comfort, light weight, and great looks, the Titan frame is Silhouette’s best seller. There are only two or three optical companies in the entire state of Arizona that will have these frames and Alvernon Optical is one of them. The colors are Vivid Teal, Vivid Plum, Vivid Blue, and Vivid Pink. Did I mention that these colors are Vivid? Each of the Alvernon Optical offices has one set of these beautiful frames. Once sold they are gone! If you like colors that are truly vibrant and enjoy the privilege of owning exclusive fashion pieces, we invite you to visit one of the six convenient Alvernon Optical locations today. These lovely frames won’t be around long.